This is how the 3/4" hole appears in the E-Z Track. Had to feed the bit into the track base and ties very slowly to avoid damaging the rails. Finally back to trains. Charging track completed. A 2W Tx coil was mounted in the hole in the E-Z Track plus 24 ga. stranded silicone wiring for connection to the Tx charger board. Here's a top view of the coil. Top of coil to top of rail is over 3mm, a bit much. I may have to order the 12mm x 22mm coil I considered earlier, but this might change the intended Rx coil. I mounted a piece of grooved styrene with 4 spacers to the ties and used a fine point brown marker pen and a regular tan marker pen to simulate wood planking. Next step is mounting Rx coils and boards on to 2 or 3 engines. This also requires adding battery protection circuitry, a run-off-charge switch and maybe a 2nd voltage regulator. 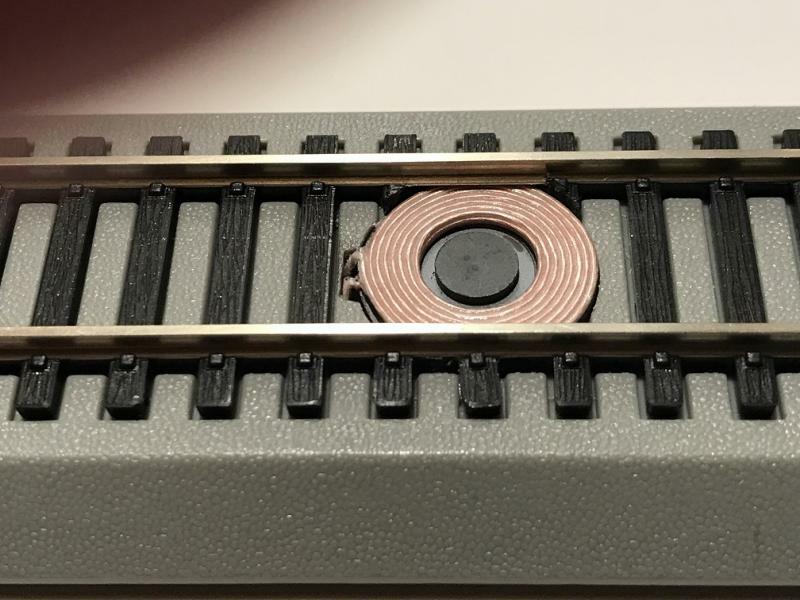 Does the coil magnetize the rail? I'm thinking out loud here, you will run the engine over the coil and turn the engine off, then turn the coil on to start the charging? If I recall, the Rx has to be off so as not to damage it while charging. Still want to do this on my O scale engines, but with using 2000 and 2200Mah batteries, I don't think there's anything that'll work yet. Right now I have charging sockets mounted on the engines and plug in the charging jack to charge, a coil inside the rails would be ideal!!! Nickel silver (grey roadbed) cannot be magnetized. But part of the induced energy may be carried away by it. 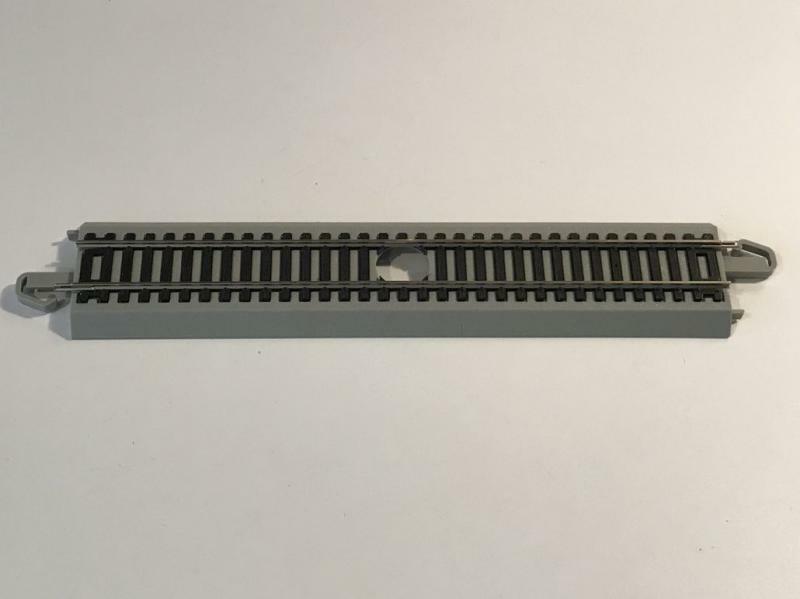 I use Bachmann's steel rail/black roadbed E-Z Track at our monthly train club meeting, but I felt steel rail would likely disrupt the electromagnetic field between the coils, so I purchased a few pieces of their nickel silver rail/gray roadbed track to minimize this effect. Yes, I'll basically park the engine on the charging track and switch from run mode to off-charge mode. But I'm working on an idea to turn all power off remotely using my Rx, a servo and a double throw switch. This would eliminate all quiescent current flow and I could forget about battery drain for months. I'll post on this if it works. As for your O scale engines, I think it can be done now. I think you need at least a 5 Watt system. 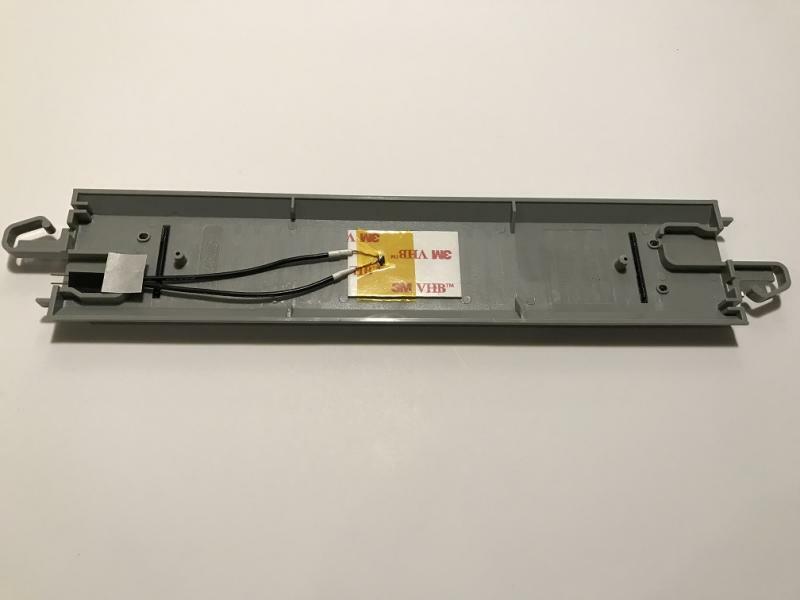 The charging track shown in the photos has a 2 watt coil which sits under the rails. 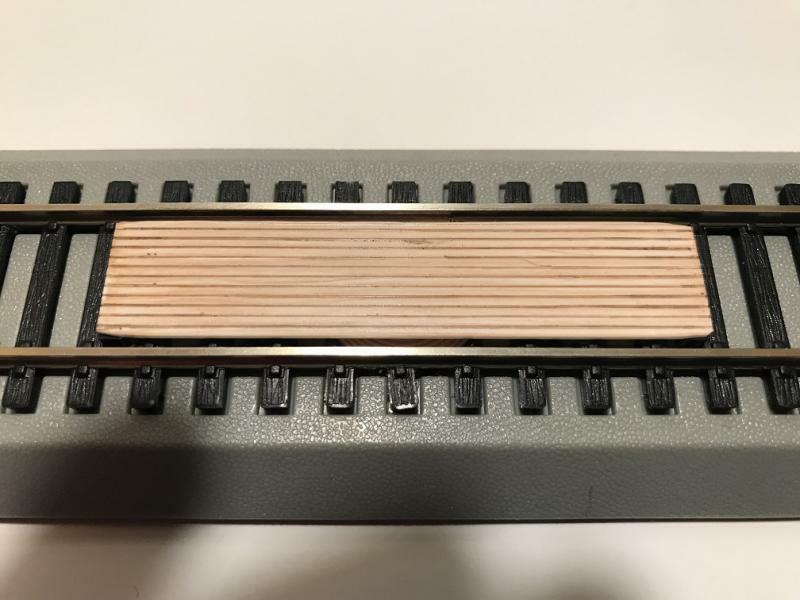 I need to finish up a 1 watt coil assembly that sits between the rails so I can compare this coil's performance at about rail level with the 2 watt coil sitting 3+mm below the top of the rails. Hopefully I'll then be able to put together a 3 watt system. It will be for a 2S battery arrangement with balance charge capability. I have the parts, also for 3S, but I have to figure out the wiring. I'll be using Panasonic's 2,000 and 3,400 mAh Li-ion cylindrical batteries, which are my "standard" batteries. I also have some yet to be used Keeppower 26650, 5,200 mAh batteries for wide body diesels or steam engine tenders. BTW, Samsung's 20700 Li-ion battery is available now with a 4,250 mAh capacity! Helmut, you are correct, but sometimes one has to pick "the lesser of two evils". As with much of my experimentation, my models are more "proof of concept" oriented rather than commercially oriented. I tend to use what is available, which started me on this path in the first place. 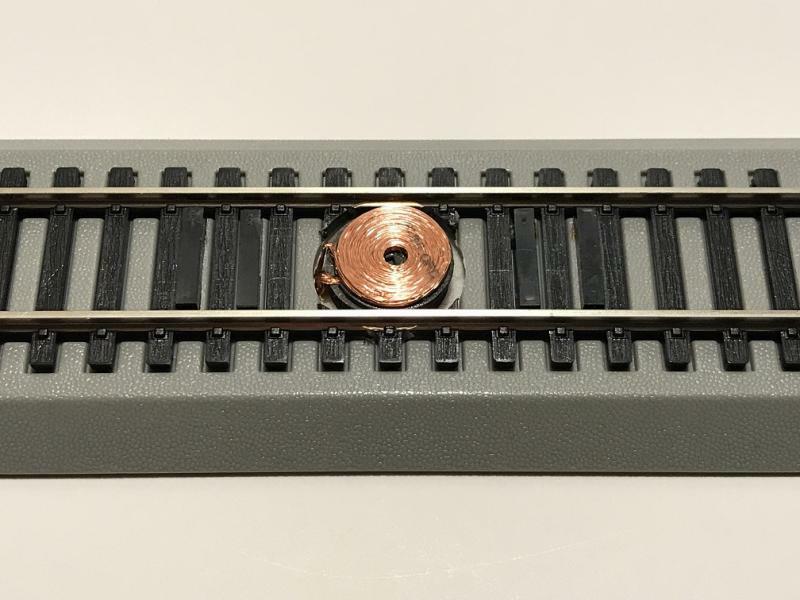 Should BPRC become a factor in the model railroad industry, I can see silver plastic rail for the charging tracks, and all track, which should eliminate the induced energy problem. I completed assembly of a 1 Watt coil for light duty use, like for batteries in a caboose or similar car for lighting LED's. 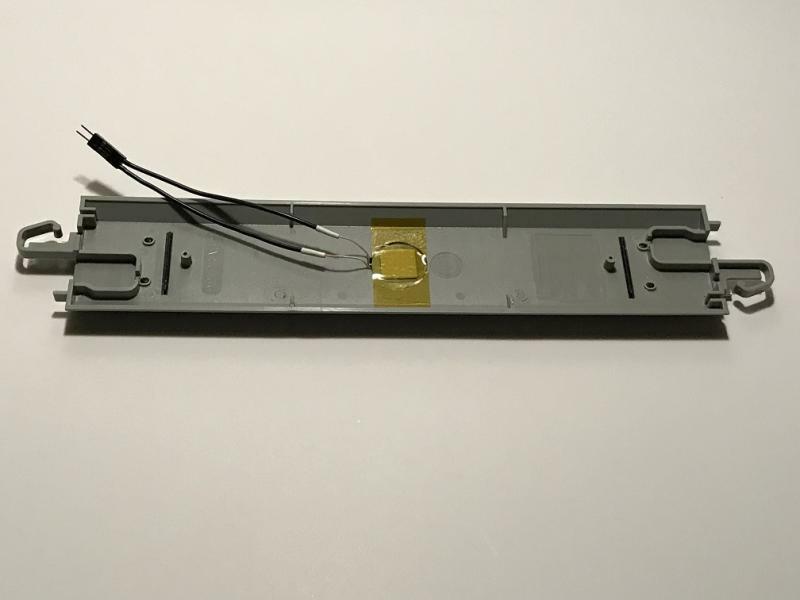 The coil sits between the rails and 1mm below the top of the rails. This should help in coupling with the Rx coil, which I estimate will be about 3mm above the rails.